The front of the Windsor Arms Hotel resembles a small neo-gothic castle. Walking down the corridors you can feel the history in the hallways. Is it haunted? If there are any ghosts lurking they’re likely benevolent and represent the vintage Hollywood stars that have stayed here over the years. But, in October, any building with a little history could be haunted – at least till the 31st. When I was a young “trick or treater” the most popular costumes were Disney characters like Snow White, ghosts made from old sheets, favourite TV characters, pirates, ballerinas, hockey players etc. But, no matter what we wore it was always about the candy, the anticipation and the thrill of the night. We loved shopping for the good stuff – potato chips and chocolate bars to give out to the kids in the neighbourhood. It was always fun finding the perfect pumpkin for the front porch. The big candle inside let everyone on the street know this was a Halloween “friendly” house. Earlier that day we’d scrape the seeds out of the pumpkins and roast them in the oven. They were delicious with salt and lingering clumps of “scary” pumpkin flesh. Sometimes we’d drive around looking at how different families had decorated their homes. Some people went all out turning their front yards into a cemetery with skeletons hanging from trees, tombstones on the lawns, giant spiders around the front door and black cats prowling on rooftops. You could really appreciate their Halloween spirit. As soon as we got back from trick or treating we’d empty our shopping bags on the living room floor to see how we scored. One of the best things about Halloween (besides the candy) was the chance to see monsters. In horror movies, with sinister costumes, (I remember I had a neighbour who had giant rubber werewolf feet with long nails and fake hair that went over his shoes) and the “deadly” decorations that spawned webs of fear between the sidewalk and front door. And, despite all these examples of terror it was a kinder, gentler time back then because we knew the monsters weren’t real. These days more and more adults are dressing up – it lets them be someone else for a night. Frankenstein, the Mummy, Werewolf, Dracula, they all looked really fake in the day and that made us love them even more. Today, the monsters are much different. They’re too real. They permeate pop culture in a bolder, more threatening way. And, its affecting the costume trends this 2016 season. So far the popular retail costumes are Creepy Clowns, dead celebrities (including Prince & Gene Wilder as Willy Wonka), a variety of superheroes with Deadpool and Batman at the top, various warriors, and not surprisingly two of the most popular store bought costumes this year are Presidential candidates Donald Trump and Hilary Clinton. 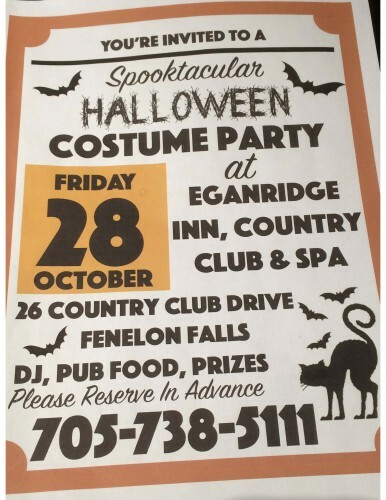 Now, if this post hasn’t brought back lots of scary Halloween memories from your childhood.. there’s always the upcoming Halloween costume party at the Eganridge Country Club on Sturgeon Lake. Its taking place on Friday October 28th and its going to be spooktacular (see below)!